What Is The Best 'Pump' Workout? TOPIC: What Is The Best 'Pump' Workout? Whether you are getting ready to pose on stage, or pose at the beach, you are going to want to look your best. The "pumped" look will definitely create a more impressive, but temporary physique. What is the best "pump" workout? Are compound or isolation movements best for creating a pump? Please include how long rests should be between sets and exercises, sets, reps, etc. Bonus Question: What supplements would increase this pump? What are the most effective, and which do not show the results they promise? After a great day of training in the gym, the blood is flowing and your muscles are feeling extremely full. Every bodybuilder lives for that feeling. Now you can achieve the feeling of "the pump" with these super-pump workouts! Not only will these workouts guarantee crazy pumps, but also a boost in hypertrophy (muscle growth) as these workouts are intense and will force your body to add some serious size! Research shows that to get a maximum pump, you must devote your full attention to each major muscle group by training one muscle group entirely in one workout. This will guarantee the "mind muscle connection," which will help you dedicate your full attention to the muscle group being trained - resulting in the ability to achieve a better pump. Therefore, each major body part gets its own workout. Lactic acid also plays a key role in getting a maximum pump. Lactic acid is a by-product of carbohydrate metabolism without the assistance of oxygen. The objective in each workout is to allow a large quantity of lactic acid to accumulate in the muscles. This will eventually lead to greater hypertrophy, as the body experiences a huge boost in growth hormone levels from the accumulation of lactic acid in the muscles. In order to create a training atmosphere where your muscles are absolutely drenched in lactic acid, you must prevent your muscles from recovering fully as you normally would in between sets. Every workout is composed of two giant sets and three tri-sets. A giant set is simply a set in which you perform more than three exercises in a row - without any rest from one exercise to the next. Tri-sets are where you perform three sets in a row without resting between the sets. Every workout will focus on pre-exhausting the targeted muscle in the tri-sets. Pre-exhausting the muscle group is to train the particular muscle growth by performing an isolation movement, followed by a compound movement. This will guarantee that the muscle is exhausted to its maximum capability - resulting in a greater pump. To get a maximum pump, you must incorporate super slow training in the giant-sets. Super slow training is basically performing each exercise extremely slowly - focusing on both the eccentrics and concentric portions of the exercise. Both the eccentric and concentric parts of the movement should be 3-5 seconds - meaning the sets will take a bit longer than they normally would, but time is not a concern - the pump is. Click Here For A Printable Log Of Day 1 - Chest. Click Here For A Printable Log Of Day 2 - Quads. Click Here For A Printable Log Of Day 3 - Shoulders. Click Here For A Printable Log Of Day 4 - Back. Click Here For A Printable Log Of Day 5 - Triceps. Click Here For A Printable Log Of Day 6 - Biceps. Remember that for each workout, you are to perform 2-3 tri-sets and two giant sets. There is to be no rest in between tri-set exercises and giant set exercises. Rest only as long as it takes you to set up for the next exercise. Remember to emphasize slow concentric and eccentric portions of the movement! Don't skimp on pre and post workout nutrition! Be sure to eat a balanced meal of carbohydrates and protein before your workout. Immediately after training, consume plenty of carbohydrates and 20-50g whey protein to kick start the recovery process. Each body part is to be given a full week's rest, as these workouts focus on gut wrenching intensity! This program is only to be followed for a span of 3-4 weeks. Using this program any longer will most likely result in overtraining. A combination of both compound and isolation movements is optimal for creating a maximum pump. Pre-exhausting the targeted muscle group with isolation movements, and then proceeding to compound movements is the best method for creating a maximum pump - something this workout focuses on. By pre-exhausting a given muscle with an isolation exercise, the muscle fibers are stimulated in a way that compound exercises fail to do. Isolation movements also bring more blood flow into the given muscle being focused on. Subsequently training with a compound exercise following an isolation exercise will bring more nutrients into the muscle - allowing for a massive pump! What supplements would increase this pump? What are the most effective, and which do not show the results they promise? It is the writer's opinion that this program alone would provide one with a pump beyond belief. However, supplements can aid you in achieving an even greater pump! Controlled Labs White Blood The best supplement that comes to mind for getting a maximum pump is Nitric Oxide (NO), hands down. I've used many NO products, and many of them fail to give me a maximum pump. However, the best NO product I've used is by far Controlled Labs White Blood. I have gotten incredible pumps using this supplement, and it works even better when stacked with Controlled Labs Green Bulge. The pumps I got off this stack were unreal! BSN's NO-Xplode also gave me some insane pumps. BSN NO-Xplode opens up the blood vessels, which in turn accelerates blood flow to the muscle. This increased blood flow allows for some mind blowing pumps and increase in the size and appearance of your muscles. NO-Xplode also increases the body's creatine saturation point, allowing your muscles to hold more volumizing nutrients! This supplement gave me some crazy pumps and made my muscles look like they were filled with helium! The nitric oxide products that failed to give me a maximum pump were MuscleTech PumpTech and MRM Metabolic Pump. Both products did absolutely nothing for me in terms of creating a pump and increasing muscle fullness. I could simply be a "non-responder" to these products, so if you are thinking of purchasing one of these products, try it out and see if it works for you! Best of luck with all of your goals! First of all, let's cover some of the basics of the so-called "pump." What Exactly Is A "Pump?" Well, to a certain extent, muscles can trap blood in them during repetitive exercise. Not so much trap, as run the blood on a shorter venous circuit than they normally would. The veins also dilate and cause more blood to flow into the muscle. This increases the volume and appearance of our muscles slightly for a short period of time. 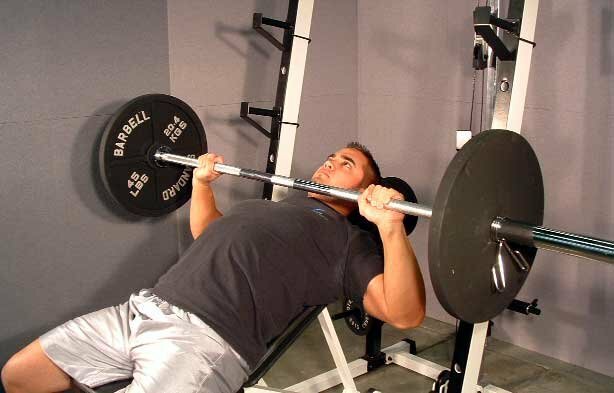 This "pump" is fairly common with any rep program that is higher than four repetitions. The pump is usually increased by the use of higher repetitions. 10-15 is usually best. Squats have been used at 20 repetitions for amazing results! How Long Has The "Pump" Style Been Around? Bobby Pandour, or Wladyslaw Kurcharczyk was the "bodybuilder" of the time in the early 1900's. He was famous for his exquisitely developed body. He was in excellent proportions, and would have been considered a very large man by today's standards. He was also famous for concentrating on doing only gymnast type exercise, and refusing to do any training with heavy weights. Pandour weighed 160 pounds, was 5-foot-6 tall and had a 42-inch chest, 23-inch thighs and 16-17-inch arms. Does A "Pump" Correspond To Muscle Growth? No, a "pump" does not correlate to muscle growth. There are many people who do not usually experience a pump, but still hypertrophy (muscle growth). I am one of these people. A lot of people are against getting a pump. Many people dislike those who train specifically for the pump. Don't worry, I won't tell anyone you read this! Pumps are useful in certain situations, but people tend to overuse them. However, if you needed a quick muscle-up for a photo shoot or contest, a pump may help you out a bit by giving you a temporarily more impressive physique. 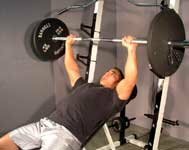 Are Compound Or Isolation Movements Better For A Pump? Which gets more blood flowing in general? Compound. Which really gets your blood flowing in a specific muscle while targeting that muscle the hardest? Isolation. Let's take a look at an example. 1-3 sets of 8 repetitions on the incline bench press. You're feeling a pump, that's for sure. You're feeling it in your delts and triceps too. That's great if you need to pump up really fast for an upper body photo shoot or something that requires a quick bulk-up, but what if you just want to experience a pump in a certain muscle group?
. You are now probably feeling an immense pump in your pectoral area. If you believe in muscle volume permanently being extended through "pumps," then this is great for your beliefs and purposes of hypertrophy. So, essentially, it's more of a preference than anything else. You can determine which type of movement gives you better "pumps," or hemodialation. It is a highly individual matter. Assuming you want to pump up for a photo shoot or a contest, this workout should do just fine. We will take the superset approach and get your muscles REALLY pumping up. With no rest in-between supersets. During each rep take 2 sec in the negative phase and 1 second in the positive phase of the lift. After each completed superset take 1 minute of rest. The human body can only hold so much blood, making it impossible to "pump" up your whole body at once. You can only do so much "pumping," therefore you should pump up your weaker areas for a photo shoot, or your day at the beach. You could also use these in your own regular program at your disposal. I suggest you do a pumping workout for each of these muscle groups once every 2-3 weeks. This would ensure that you stretch your veins a little, and get some extra blood flowing into them. Click Here For A Printable Log Of The Quads Pump. Click Here For A Printable Log Of The Hamstring Pump. Click Here For A Printable Log Of The Chest Pump. Click Here For A Printable Log Of The Back Pump. Click Here For A Printable Log Of The Shoulder Pump. Click Here For A Printable Log Of The Arm Pump. Click Here For A Printable Log Of The Calf Pump. To help keep your pump, you will need to continually flex/pose the muscles being pumped after your done working them. You can't do a full body pump; there just isn't enough excess blood. You will have to carefully choose the muscles you need to pump to look at your best. How Could I Incorporate Those Routines Into My Regular Schedule? What Supplements Could I Take To Increase My Pump? What Ones Are A Waste Of My Money & Time? This will definitely increase your pump, at the expense of a little definition. This will also help increase your lean mass gains and overall strength and size gains. This supplement's best use is definitely in a regular training program. This should produce an amazing pump. It should produce a pump better than that of creatine. It can be expensive, but you can find it pretty cheap here. This would the best choice for any of your pumping needs. Be careful though, if this is in use with any sort of testosterone booster, pumps have been known to be painful. For specific brand names of pump increasers that do indeed work, I would have to say that Controlled Labs White Blood is the overall best nitric oxide product. The Controlled Labs Green Bulge Creatine works extremely well also. Put the two together, and BAM. You're huge for a bit, and your recovery and stamina is increased due to increased blood flow. This in turn leads to larger overall musculature. I have used creatine and NO2 from Wal-Mart before. The combination worked rather well, and I was pleased for the thirty dollars and one month I got out of it. This is highly individualized, as certain people get the best from certain products. I have yet to try any of the NO2 products from BSN, but I have heard wonderful things. I say just stick to Controlled Labs for now, and then probe around if that doesn't work for you. Good luck Ladies And Gentlemen! !